will be able to understand machine function, to rapidly repair the machine and order any necessary spare parts. To perform appropriate maintenance so that the machine is always in best condition for the customer, the service personnel must adequately understand and apply this service manual. This service manual is made up of five chapters and appendix. 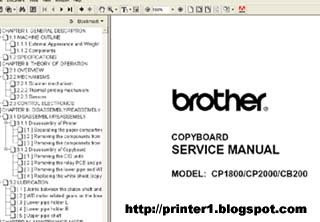 0 Response to "BROTHER CP1800 / CP2000 / CB200 SERVICE MANUAL"